Inspired by a keepsake wedding gift, these cufflinks are crafted from real watch parts. The inspiration of an unforgettable wedding story, these expertly crafted cufflinks bring a nostalgic touch to steampunk style. Artist Joseph Cirincione's grandfather pulled Joseph aside during his wedding reception and gave him a beautiful pair of antique cufflinks bearing the initials they shared: "JC." Touched by the keepsake, Joseph began creating similarly sentimental cufflinks from high quality materials that make a fitting accent for French cuff occasions. 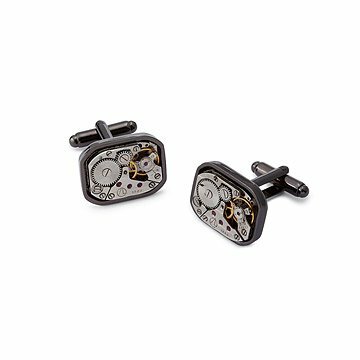 These cufflinks feature the mechanical minutiae of real watch movements and gears, set in substantial gunmetal backs. They'll bring a subtle note of steampunk sophistication to any outfit, from creative casual to formal attire. Made in New Jersey. Joseph Cirincione was originally inspired to create his own line of cuff links while his now wife, Katie, and he were planning their wedding. Further inspiration to pursue his dream came from his late grandfather, Joseph Cirincione. His grandfather pulled him aside during the reception and gave him a beautifully crafted pair of cuff links bearing their initials "JC". Simply wipe with any jewelry cloth, handle delicately. Something unique for the watch lover in your life. Bought these cuff links for my hard-to-shop-for husband and they were the perfect unique gift for him!